Its a rather pretty small brass jack plan with no name present on the body or blade. Front grip and back handle are both satin walnut. Adjustment of the blade is by the large gnurled adjuster sticking out above the rear handle. 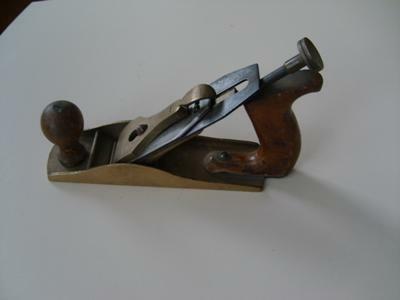 I am a carpenter and I have not seen this exact plane before. Very frustrating. Any thoughts from anyone would be wellcome. Seen them used by timber framers, brass doesn't react with the oak.